When it comes to good skin, at least there’s always photo-editing software. In real life, however, the only solution to covering up age spots, acne scars, redness, and dark circles is slathering on creams. But Opté’s beauty wand is like taking a Photoshop airbrush to your skin in real life. In fact, after watching it in action, I’m half-convinced it’s witchcraft. 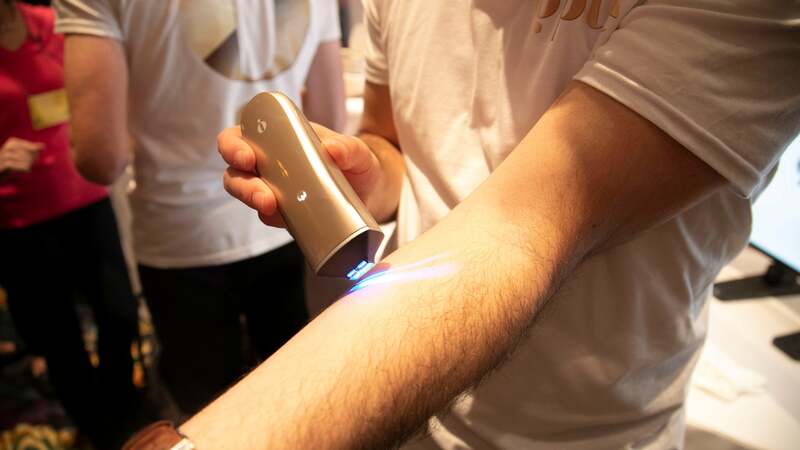 The wand works by scanning your skin using blue LED lights and an integrated digital camera. According to Opté, the lights highlight the contrast in skin melanin to detect up to three times more pigmentation than the naked eye. Meanwhile, the camera takes up to 200 images per second that are then analysed in real-time using 70,000 lines of code to figure out the size, shape, and intensity of the pigmented spot. An Opté representative told me the wand is essentially comparing the skin tone of a spot to the natural skin around it. Once it detects an area that doesn’t match the rest, a microprinter in the wand then corrects the spot using a picolitre—that’s one billionth of a litre—of a serum containing mineral-based pigments, moisturiser, and spot-lightening ingredients to fade the hyperpigmented area over time. It’s a very subtle process. You’re essentially waving a wand over your skin, and the result is pretty much the same as expertly applied foundation. Except, since you’re watching in real time, the transformation doesn’t appear quite so dramatic. But I have to admit, when I saw the tech in action, I was flabbergasted at watching multiple age-spots from a model just up and disappear. I was more bewildered when a makeup removing wipe barely picked up any product. According to Opté, the device should work with any type of hyperpigmentation, including freckles, age spots, and acne scars. Opté also said it handles redness really well, but that the device does struggle with large areas of discoloration, as you might see with severe rosacea. I had them try on a very dark beauty spot on my arm, and while it didn’t completely disappear, the wand made it less apparent. So far, there’s no release date or info on pricing. Opté says it’s still in the process of working out those details for consumer release. It will be interesting to see how well the device works on darker skin. Opté assured me that it should work with all skin tones, but historically LED-based tech, like heart rate monitors in wearables, have often struggled with darker skin tones. Still, if this eventually means I can toss out all my foundation, concealer, and colour-correcting sticks, Opté can straight up have my money.